Scabies isn't pleasant, but scabies treatment is fairly easy. A prescription cream will help heal the rash and stop the itching. Scabies is an itchy rash caused by mites (tiny bugs) that like to live in people's skin. The scientific name for the mite is Sarcoptes scabiei. Although it's pretty gross to think about something living in your skin, the mites are so small that you can't see them without a microscope. Getting scabies doesn't mean that you're not clean, and it doesn't mean that you don't take care of yourself. 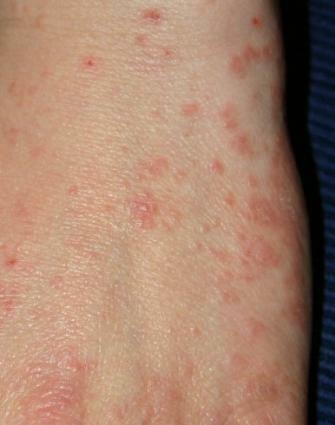 Scabies is easily passed from person to person. It's common for kids to pick it up at day care or school. Children can then pass it to their parents and siblings. It also shows up in nursing homes and other places where people live close together. There are other skin conditions that can look like scabies. Your doctor will examine the rash and look for the tell-tale red lines. He may also take a skin scraping to examine under a microscope, to look for the mites. The doctor might also rub a small amount of ink onto the skin, to highlight the burrows. Or, he might use a special light to see if burrows are present. Antihistamine pills. The itching is caused by an allergic reaction to the mites. Antihistamines help calm allergic reactions. Calamine lotion. Calamine can soothe itchy skin. Cool baths. Cool water, either in the bathtub or on a cloth, can help calm irritated skin. Permethrin Cream (brand name Elimite). Permethrin is also used to kill lice. For scabies treatment, the cream must be applied to the whole body, not just the affected area, and left on for 12 hours. A second dose one week later may be recommended. Lindane (brand name Kwell or Scabene). Lindane is an older treatment. It's no longer considered safe in children because it can affect the nervous system. It may be used as a second-choice treatment in adults. Sulfur ointment. Sulfur is sometimes used in pregnant women and very small children because it's thought to be safer than the other choices. Some people are severely allergic to this medicine, so it's important to discuss any allergies with the doctor. Crotamiton cream (brand name Eurax). Crotamiton does not seem to work as well as permethrin for treating symptoms and preventing secondary infection. People who are ill or have weakened immune systems may need additional medicine. The scabies mites can only live for a few days without a human host. However, that's long enough for them to spread. The best way to keep scabies from returning is to wash all clothes, sheets, towels, and anything else that may have come into contact with the infected person's skin. Fabrics should be washed in hot, soapy water and dried at the "high" heat setting in the dryer. If something can't be washed, you can kill the mites by starving them. Place the item or items in a plastic bag and seal it. Leave the bag alone for about two weeks. By the time you open the bag, the mites should be dead. You should also vacuum your home thoroughly and then throw away the vacuum bag. Family members and anyone else who has had close contact with the affected person should be treated, too. The treatment is exactly the same, even if there aren't any symptoms. It might be inconvenient to apply the cream or to wash all your sheets and towels if you haven't developed the itchy rash. However, prevention can be far better than waking up one morning to find that you have scabies mites living in your skin. Additionally, since scabies is so contagious, getting treatment saves you from passing it along.